This week on Spellburn, we invited a bonafide Dungeon Crawl Classics neophyte to the show to share his reviews, rants, and reservations about our favorite system. You know we love this game – we’re doing a podcast about it – but what about everyone’s favorite grumpy grognard from two of our sister podcasts, Save or Die! and THAC0’s Hammer? By special arrangement with Wild Games Productions and Mrs. Hallstrom, join our judges in welcoming our special guest for this episode, Glamorous Glen Hallstrom! Glen will share his new-to-the-sytem reviews, rants, and raves, as well as take a short trip through the character funnel live on-the-air. Also – we announce the winner of the “Name That Stroh” contest! 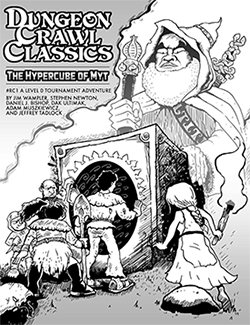 Alternate Occupations for DCC RPG – http://rpg.drivethrustuff.com/product/104218/Alternate-Occupations? Another good episode, gentlemen. Keep up the good work! My last name is a pain to say so thanks for trying. I’ll try to show how to say it below if I ever am lucky enough to be named on the podcast again. I’d also like to recommend to the emailer who wanted to check out DCC who was overseas if you can handle a slower pace there are a handful of Play by Post games for DCC that he could try to get into. As a shameless plug i’ll push my DCC game on unseenservant.us which is open to any and all. I try to run it like Gary and the gang used to and allow people to hop in and out as they please making it a seamless gaming experience for all. Either way I hope you find a game to play DCC is great! For ruling the restoration spell, I would rule the same way. It doesn’t say you can split the points between the abilities, so it’s just one. However, on the subject of the or/and usage, would not the use of “and” imply that you would not have to split the points, but instead get the full restoration to each attribute? As an example (I don’t have the book in front of me for a direct example): “target heals 7 points of damage from Strength and Dexterity.” This implies that each attribute goes up by 7 points, not that 7 points total are split between them. …and don’t forget it takes a Turn (10 minutes) to cast — not a Round (10 seconds). So, it’s not something that’s going to get used on the fly in combat. The Grumpy Grognard was painful to listen to. He kinda sounded like a friend that was guilted into doing something he didn’t really want to do. Please save the two hour episodes for guests like Stroh or Goodman himself. To end on a good note I loved the first seven episodes. Finally got a chance to listen to the whole episode, and I have to disagree with this comment. For anyone familiar with the sister shows Save or Die and THAC0’s Hammer, this is vintage DM Glen. He’s entertaining and you never have to wonder what he’s thinking. After hearing Glen slowly warm up to the idea of DCC on these other shows, it’s cool to hear his overall take here on Spellburn. I think his views on DCC likely capture those of a lot of grognards: not opposed, but also not necessarily ready to dump their preferred version of D&D to run DCC. I think Glen makes a lot of great points, and all with his usual John-Goodman-esque flair. Maybe not for everyone, but definitely entertaining! One corrective I would add is in regards to Magic Missile not being an auto-hit in DCC. Maybe I’m splitting hairs here, but it does auto-hit; you just have to make your spell check first. This makes a difference because rather than also having to roll against variable armor classes ranging from 10-20, you’re only rolling for a 12 or more on your spell check. As the wizard progresses, this gets easier to do. As long as the spell goes off, it’s auto-hit. Love this podcast. You guys are great. Glen is a massive tool and every time he spoke it drove me crazy. You guys are saints for dealing with that guy. Whens the next episode it a month?.!!! Great episode! I like DM Glen’s perspective. One question: where did you get the music you used for the example encounter you ran for him? I like using background music in my games, and that’s a great soundtrack. Keep ’em comin’!